I hope you’re all having a fantastic Halloween and are enjoying your treats. Remember to keep the chocolate treats away from your pets. Have fun! Elgin with another amazing carved pumpkin. We are at the end of October, so that means we are also at the end of National Adopt a Shelter Dog Month so I thought I’d share a few more rescue dogs that are looking for new homes. These are all from UK based rescue centres, and they all deserve a second chance. If you are looking for a new dog please consider adopting one from a rescue centre rather than buying a puppy, there are so many dogs that need new homes. Rescue centres often have puppies that need homes too, it’s not all adult dogs or ‘problem’ dogs. It’s so rewarding getting a rescue dog. It can be difficult at times, but training a puppy can also be hard work. Right that’s the end of the lecture, here are some adorable dogs for you to look at! Sophie is a lovely 4 year old beagle. Although she is an ex-breeding girl Sophie has been living in a house, walks on the lead and we believe she is house trained. She has happilly lived with young children and other dogs and if you want to adopt her and have a cat we can test her to see how she reacts but we are told she is good with everything. Sohpie could live with other dogs or in the right circumstances be an only dog. Simon loves nothing more than a cuddle with all the team here and hanging out with his friends, he could live with another dog and children 7+ years of age. Beautiful Bandit is a 6 year old crossbreed who has bundles of love to share with all of his human friends. This lovable, affectionate boy enjoys learning new tricks, playing with his toys and going on exciting new adventures. Bandit is suitable to live with children aged 11 and over and would like to be the only dog in the home. His new family should continue his dog socialisation to help him gain some doggy pals in the future. Bandit isn't a fan of those pesky cats so a home with minimal cats in the neighbourhood would be ideal. His active and playful nature would be best suited to a home with a medium, secure garden where he can play to his hearts content! High fences are essential for this true explorer! Helll’OOOOO’ there! My names Ice and I’m a fun-loving malamute lady. Maybe you’ve owned my breed before and know all about my wonderful sounds and the things I need?! I’m four years old and super active. To be perfectly honest, I would like my humans to be around most of the time as I can’t get enough attention! I do get bored if I’m not getting all the attention I crave (and deserve, thank you)...this can lead to me being a bit vocal but I DO have a lovely singing voice! My favourite thing is playing, I think its really pawesome. I’m even quite talented at a spot of agility so I’d love a large garden I can play and show off in. Out on my walkies I like meeting other doggos but I would like all the fuss and attention as the only dog in the home please! I’d also like to live with older children (teenagers). Please fill out a homefinder today if you think you’re suitable so I can show you just how lovely I am! Frankie is a very bright and fun loving dog with bags of character and energy. He is looking for a training minded home to help see him through his adolescent years and owners who will enjoy being a part of that process. For your effort you’ll be rewarded with an intelligent, affectionate and a very rewarding dog to be around. Frankie will be best in an adult only environment and will need to be the only pet in the home. He will need some training before being left home alone. Hello, my name is Daisy and I am a beautiful 8-year-old female Jack Russell Terrier. I was not getting along with the other dog in my previous home, so I am now looking for a new home of my own. I am a very active girl who can be a little anxious in new situations, but once confident loves getting attention from everyone that I meet. I’m very keen to explore new places and will often try my hardest to get to them as quickly as possible, so it is important that any new owner can work on my lead walking with me as well as continue my basic training and socialisation. I’m looking for a quiet home where there’s not much coming and going. I can get a little distressed when there’s lots going on outside my house, so a home in a quiet area or in a rural location would suit me best. I would make a great companion for an active, terrier-experienced family. I love to be out and about exploring and I love playing with my toys; I will eagerly play fetch and drop my ball for it to be thrown again! But I do prefer my own space when it comes to being around other dogs. I’m quite happy if they leave me alone but I’m definitely not fond of them in my face! I would be happy in a home with children aged 8+ that are used to dogs and I would prefer to be the only pet in the household. Over the last few months there doesn't seem to be a week that goes by where I don't have at least one appointment. I’ve had so many tests recently, including MRIs, EEGs, 48 hours EEGs, tests on my throat and much more. Add to that appointments to see consultants, speech and language appointments to help with my swallowing and choking problems, and home visits from physiotherapists and occupational therapists. My whole life seems like it revolves around medical appointments at the moment. I’m just hoping that I get some answers soon as life is very difficult. I usually have at least two joint dislocations a day which is obviously extremely painful, at least two severe muscle spasms/seizures and I choke regularly too as I can’t swallow properly anymore. I fall daily (when transferring from my bed to my wheelchair etc) and I often get injured during the falls because my body is so fragile. Hopefully the many tests will soon result in some better treatment that will improve my quality of life, because at the moment I’m a prisoner in my bedroom. My assistance dog Elgin patiently waiting by my wheelchair at the hospital. I’ll stop the whining now and move on to something more positive - my incredible assistance dog Elgin. He’s been amazing recently, he’s helped me through some tough times. He’s helping with his usual tasks like helping me dress, but he’s also been learning new things like fetching help as soon as I start choking. It’s quite scary sometimes, but knowing Elgin is there is a big comfort to me. Hospitals are very difficult for me, they usually trigger anxiety attacks, but my clever pooch has been keeping me calm. He’s so good at the hospital, and so patient. Everyone loves him, he always gets so much attention. 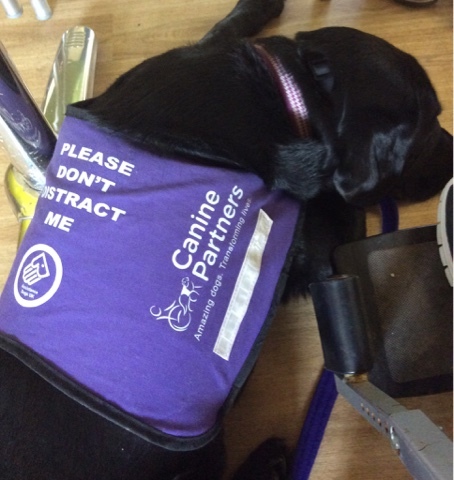 Hospitals can be difficult environments for assistance dogs, but Elgin takes it all in his stride and seems to enjoy his visits there. He especially enjoys the fun trips to the park afterwards - and his trip to the pet shop to choose a new toy or treat! Fingers crossed I will get some test results soon and that the doctors will be able to better control my severe pain. But in the meantime I have my special dog to give me lots of cuddles - they always make me feel better! This sports towel is really handy for the trips to the gym and other sporting activities. It’s available in four colours, I chose Rubin Red which is lovely and bright, it looks great (although I’d have described it as more of a pink than a red). Because it’s so bright it wouldn’t be easy to mislay it. It’s a good size and has a very useful zipped pocket at one end. It’s perfect for keeping your essential valuables safe and to hand while you train. The towel is lightweight but also very soft and absorbent. My daughter is very sporty and uses this at karate practice and at the gym. The pocket keeps her mobile phone safe while she works out. She’s told me to give this five stars. We received this product free of charge for the purpose of an unbiased review. Find a fresher face when you peel away our purifying mask: the ideal gentle peel specially formulated for problem t-zone skin. Removes impurities and dead cells whilst cleaning and reviving the skin. Apply the masque thinly and evenly to the face and neck, avoiding the delicate eye and lip area. Lay back, relax, and drift into pleasant thoughts. After 10-20 minutes orwhen the masque is totally dry, gently peel off masque (never pull) to revealyounger, fresher looking, clearer skin. Wash off any stuck bits with water. Not for use on sensitive or broken skin. Like most teenagers I have quite oily skin, so I was keen to try the 7th Heaven cucumber peel off mask for oily skin. I tried the limited edition Halloween version, but it’s available all year around with normal packaging. This face mask was easy to apply. It made the area around my eyes sting a little when first applied but this soon settled. It took a bit longer than predicted to dry, about 30 minutes in total but didnt feel at all unpleasant. It was very easy to remove and peeled off well. The over all result feels really nice. My face feels really soft and very clean. Definitely the best Halloween mask I have ever worn - not a trick but most definitely a treat! It really is a great beauty treatment, it really suited my skin and I’m pleased with the results. It’s fantastic value at £1 too, it’s really affordable, even for youngsters like me. I will definitely be looking to buy more of this brand and wont be waiting until next Halloween either. Five stars. Also available in a non Halloween version. Available from stockists nationwide for just £1. Having tried several motion sensor lights, this one is a breath of fresh air. Most eat up batteries and dim very quickly, but this one is rechargeable so no more need for batteries. According to the packaging a two hour charge lasts for two months. Even if it only lasts for half of that time, it is still very impressive and will be so much easier for us. The light is mounted on a back plate which can be stuck to your chosen surface with a sticky pad. It’s bright and responds quickly to any movement around it. We have this light on our landing to enable both us and our daughter to navigate safely in the night. It works brilliantly, we are very pleased with it. It’s definitely worth the price and I’d say it was very good value for a product of this quality. The best motion sensor light we’ve tried. Five stars. We’ve shared some recipes with you for Halloween cakes and snacks, now we have a recipe for some Halloween drinks. Kids will love these scary looking milkshakes! They’re made using Shaken Udder Top Banana or Vanillalicious milkshakes so they will be super tasty. I’m a big fan of Shaken Udder Milkshakes, especially the vanilla flavour, they are so creamy and delicious. Why not give this recipe a try?! Pour the milkshake into 2 glasses and add a few drops food colouring until it turns the desired colour. Top with whipped cream, squirt over the strawberry sauce and top with the sweets. Visit http://shakenudder.com/what-we-make/ to find out more about Shaken Udder products. Whether you’re planning a spooky Halloween party or having a cosy night in watching horror films, iconic meat SPAM ® Chopped Pork and Ham offers friends and family more treats than tricks this Halloween. Quick and easy to make, these specially created Spooky SPAM® Sandwiches and SPAM® Spooks are guaranteed to put a smile on the scariest guest’s face. Spread each bread bat with cream cheese. Place two peppercorn eyes on each bat. Spread each bread pumpkin with cream cheese. Cut out scary cheese eyes, nose and mouths for the pumpkin sandwiches using the Red Leicester cheese, then add the black whole peppercorns to the eyes for the pupils. You can find lots more SPAM recipes on their website here. It contains 1 main zipper section compartment and 1 inner pocket.Easily hold your phone, money and change. On receiving this bag I was very pleased with it. It really is a nice looking bag, and it’s a good size too. There’s plenty of room to carry your purse, phone, keys and other essentials. It has a handy pocket on the back of the bag which has a zip closure. The main body of the bag has two internal pockets. Unfortunately that’s where the positives end and the negatives begin. The bag has a great design and the materials feel of good quality, but all of that is spoilt by poor workmanship. Loose stitching on the side of the bag. Very rough stitching on the strap. The big disappointment with this bag is with the stitching. It is very poor indeed and has spoilt this bag for me. There is a very rough bit of stitching on the strap, and a loose bit of stitching around the side of the bag. If this bag had been perfect I would have given it five stars as I love the design. Unfortunately with these faults it only warrants three stars. This baby teething toy is available in two designs - a yellow lion and a purple deer. We chose the lion for our little girl as I love the bright colours. The lion is very cute and very colourful, my little one got very excited when she saw it. There is a rattle sound in the head of the toy which keeps my baby amused. The teether itself is flexible so it doesn’t hurt my little girl’s gums. She loves the lion’s mane which is made from ribbon tags. She likes to run her fingers through the tags and they also help her to pick the toy up easily. This is a great toy and it’s great value for money too. Five stars.